Fig. 3.80 Epistaxis. Anteriorly on the septum there is anastomosis of several arteries (the sphenopalatine, the greater palatine, the superior labial, and the anterior ethmoidal). This site is called Little's area or Kiesselbach's plexus, and is the commonest site of nose bleeds. Although associated with alarm, most epistaxis is short-lived and trivial. It is better to sit upright since the blood tends to be swallowed, causing nausea on lying down. There are numerous causes of epistaxis. Some, such as trauma and acute inflammatory nasal conditions, are obvious and common, but the more serious local and general causes must not be overlooked. 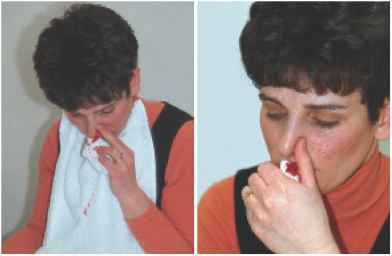 Diagnosis must follow control of the epistaxis. Hypertension and blood dyscrasia are important general causes; neoplasms and teleangiectasia may also be underlying local factors. Fig. 3.82 Incorrect technique for controlling epistaxis. The pressure is over the nasal bones and ineffective. The arrow indicates the site where pressure should be applied. Fig. 3.81a, b Control of epistaxis. Firm pressure with the finger or thumb on the lateral wall of the nose opposite Little's area on the side of the bleeding, if maintained for about four minutes, will control the bleeding. Fig. 3.83 Cautery. If epistaxis is recurrent, cautery (which is painless with local anesthetic) to the bleeding point is necessary, either with galvanocautery or with a chemical (e.g., trichloracetic acid or silver nitrate). Trichloracetic acid used in this case causes the bleeding site in Little's area to become white. 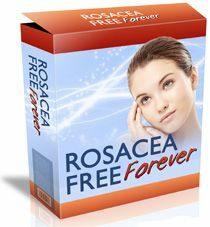 Care must be taken to avoid the chemicals running onto the skin of the vestibule or face, as scarring will result. 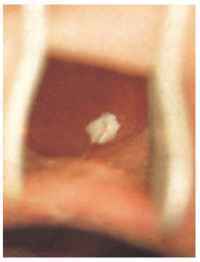 A topical anesthetic is applied to the nasal mucous membrane in Little's area for galvanocautery but, with silver nitrate and trichloracetic acid, no anesthetic is needed, and the procedure is painless providing the vestibular skin is not touched. It may be preferable for cantery to be carried out with the patient lying down, and with the help of the operating microscope (see Fig. 1.14a). Fig. 3.84 Hereditary nasal teleangiectasia. 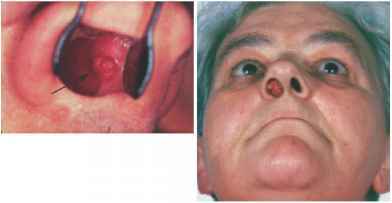 Frequent and often severe epistaxis is characteristic of this condition, in which numerous leashes of bleeding vessels are apparent over the nasal mucosa (a). 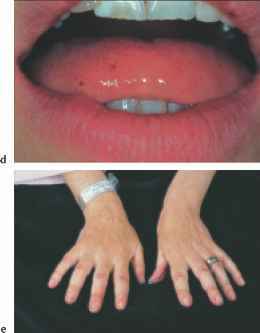 Telangiectasia are also seen elsewhere in the body—on the skin of the cheek (b), the lips (c), the tongue (d), the hands (e) and fingernails (f). 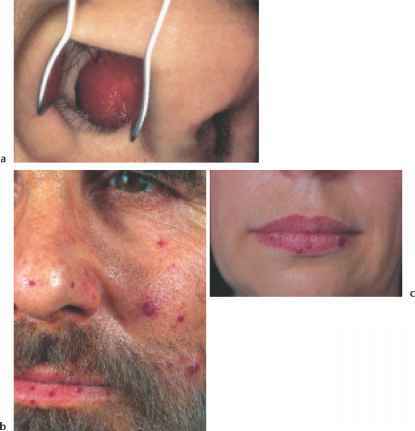 Cautery may be effective in the early stages, but this condition is difficult to manage, and may require either extensive skin grafting of the nasal septum to replace the vascular septal mucosa, or estrogen therapy. Fig. 3.85 Septal hemangioma. a A vascular sessile polyp is seen on the septum (hemangioma), which is the cause of severe, recurrent bleeds. Treatment is by excision, or cautery if the lesion is small. b A large septal hemangioma occluding the nasal vestibule. Sometimes this is called a "bleeding polypus of the septum." Nasal hemangiomas may develop during pregnancy and be a cause of epistaxis at this time. Epistaxis from the anterior septum may be profuse and alarming, but firm sustained pressure on the nares is invariably effective. Posterior epistaxis from the sphenopalatine artery may be very severe and difficult to manage. Nasal packing is needed to control the acute phase. A posterior bleeding site may be identified with the nasal endoscope and cauterized. 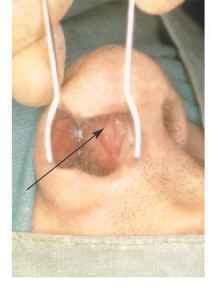 With more severe bleeding, the sphenopalatine artery may be clipped or ligated endoscopically. Ligation of the maxillary or external carotid artery is necessary if bleeding persists. The terminal branch of the anterior ethmoidal artery may be the site of bleeding superiorly in the nose, particularly with nasal fractures; this vessel may require ligation. Radiographic techniques enable embolism of the terminal vessels to be carried out via an arterial catheter, and this is an option in managing very severe epistaxis, which may become life-threatening.